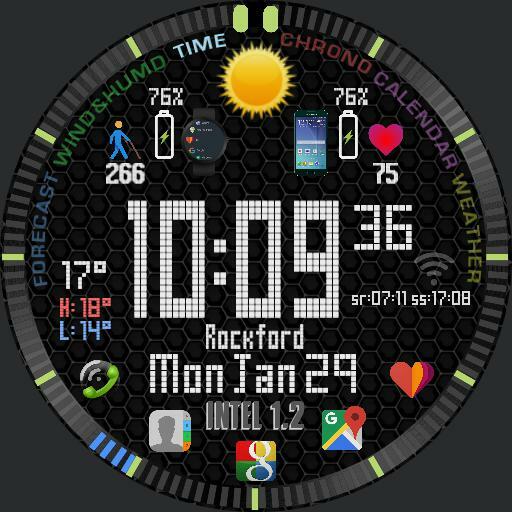 This is the Intel 1.2 featuring multiscreen with weather, forecast, calendar, stopwatch, and agenda. Taps will vary per screen depending on what function you are in. The app buttons you will have to taylor for your own apps. TIME Will give you your basic information. Time, current temp, high and low temp, location, day and date, and weather. conditions. FORECAST Will give you the forecast for the next 4 days including conditions, high and low temps. WINDHUMD Barometric pressure and humidity level, wind speed and direction. CHRONO Stopwatch and also houses the step counter. A new feature is the CHRONO will light up blue on any screen if it is running. I created this script so incase you forget about it or accidentally engage it, youll know and turn it off to save you battery. AGENDA Will show the next 5 calendar events from your calendars that you select in WM.